Brunei Darussalam (meaning an Abode of Peace) is a country that one often cannot even locate on the world map. When I told friends I was coming to Brunei one said “oh, why don’t you also visit India since its so close.” Others told me they had to look the country up on Google Maps. A geographical lesson is obviously in order. Brunei is located on the large island of Borneo and is surrounded by the Malaysian states of Sabah and Sarawak. The rest of the Island is part of Indonesia. Brunei is separated into 2 distinct sections of land, separated by the Bay of Brunei. A plane ride from Bangkok Thailand takes about 2.5 hours. My trip to Brunei highlights an important part of why I travel, especially to a country that does not see a lot of tourists. Trips like these break down any pre-conceived notions I might have about a particular country as well as help to offer insights for others. 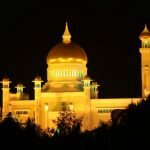 Tourists often use Brunei as a 1 or 2 day stop over between destinations – that is too short of a time; this country is certainly worthy of additional exploration. Brunei was an unexpected surprise during our recent visit. While often overshadowed by its neighbors Indonesia and Malaysia Brunei offers much for the independent traveler – including stunning mosques, the world’s largest connected water village, a surprising selection of foods, unspoiled virgin rainforest, and friendly genuine people. This is a very safe country, the people I met were honest and helpful. The capital city, Bandar Seri Begawan is small and the major highlights can easily be seen in about a day. Much of the country is covered with virgin rainforest and the majority of the population lives in or near the capital city. With the country’s independence coming merely in 1984 Brunei is a fairly young country. This was a protectorate of the UK and is part of the British Commonwealth. As a result English is commonly spoken. Food is surprisingly inexpensive especially if you eat at local markets or cafes. There is relatively very little agriculture; much of the fruit and vegetables are imported from nearby Malaysia. Gas prices are fixed and usually remain so for a number of years. Drivers are generally courteous and will stop for pedestrians (the reverse of many countries). There is somewhere between 3 and 4 cars per Brunei household and with gas so cheap its not surprising that there are very few taxis. As a result it can be somewhat difficult to get around the country for independent travelers. Good options are to rent a car and create a plan that includes a mix of independent travel and the use of a local tour company. Brunei offers its citizens an incredible standard of living when it comes to medical needs. Hospital and medical stays are nearly free – for major surgeries the cost of flying one to Singapore and the surgery itself is covered. Weekends in Brunei are not Saturday and Sunday, but rather Friday (day of prayer) and Sunday with Saturday being a regular work day. Alcohol is forbidden although you can take up to 1.5 liters into the country (either overland or by plane). As a result you often find a stream of cars leading to the Malaysia border the evening before a weekend day. There are a number of tour operators in Brunei but none more professional, efficient and personal than Travel Hub. The owner Adam Tan, has been involved in the local travel scene since 2000. Brunei is not an easy country to get around for independent travelers and Travel Hub secures all transportation and arrangements. They offer a variety of partial and full day trips as well as longer options into the rainforest. Travel Hub offers tours and sightseeing options to any of the attractions that we visited during our time in Brunei. Their website is currently under construction, www.travelhub.com.bn but you can email Adam directly at: info@travelhub.com.bn for pricing and tour details. Mosques – two of the grandest mosques you will ever see are in Brunei. Each one was built by one of the Sultans, the current Sultan as well as his father. Both mosques are open to visitors during certain hours – Friday is the main prayer day and the mosques are closed for much of the day. Visitors wearing shorts (male or female) will have to wear one of the long robes available at the front of each mosque. Special carpets are setup for visitors. Sultan Omar Ali Saiffudien Mosque is located in central Bandar Seri Begawan. This was built by the current sultan’s father in 1958. This mosque is especially beautiful at night when it becomes “golden”, lit up by all the lights. For a visual contrast check out part of the water village located directly in front of the mosque. The current Sultan built the Jame Asr Hassanil Bolkiah Mosque in 1992; it is located just outside of central Bandar Seri Begawan. 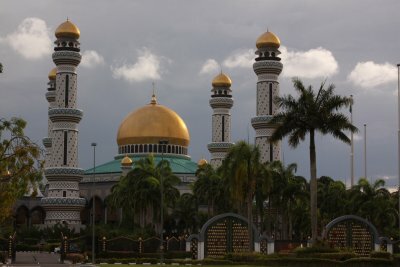 This is the only mosque in Brunei to have seperate prayer rooms for women and men (women usually pray in their homes). This mosque bars no expenses and its beauty is reflected in the mosaics, colorful tile and gold. The crescent moon at the top of the main dome is solid gold. Oil and gas is integral to the prosperity of the country and the oil fields are centered around the town of Seria where oil was first discovered in 1929. This site is also known for its WWII history and Japanese occupation. Today all Brunei’s O&G production fall under one company Brunei Shell Petroleum (BSP) owned by the government of the Royal Sultan, Shell Oil Company and Mitsubishi Corporation. Often a visit to the gas fields will include a stop at the Sungai Lian Forestry Museum. This small museum with its somewhat dated looking exhibits focuses on various aspects of the rainforest and its respective wildlife. Highlights include a display about rattan wood (more than 80 species) as well as their preserved wildlife specimens. The museum averages about 5.5 visitors a day so chances are you will be alone in the museum! Admission is free of charge. One of the highlights of any trip to Brunei is to see the Proboscis Monkey in the wild. This monkey can swim and is famous for its long nose which bobs above the water as it swims. Within 20 minutes of the main port in Bandar Seri Begawan you can be in the monkey’s home territory. Their diet is rather limited; they only eat young mangrove leaves so the mangrove swamps are where you have a chance to see them. They travel in packs, one “king” and lots of children. They are rather shy so its critical to be quiet when searching for them along the riverbanks. Boats can be hired right at the main pier in Bandar Seri Begawan. Allow about an hour+ for a round trip. On the way to the Proboscis territory you will pass in front of the Royal Palace and the adjoining pier. The Royal Regalia Building houses a large collection of Brunei’s historical royal regalia. Entrance is free of charge – photos are allowed in the main rotunda but not in the side galleries. Lockers are on site to store cameras and or cell phones. Allow at least 90 minutes here or more if you want to see all of the side galleries. Highlights include exhibitions on the Coronation of 1968, the Silver Jubilee (the current Majesty’s ascension to the throne in 1992), a Royal Exhibition room and the history and development of the Brunei Constitution. The museum (located in central Bandar Seri Begawan) is open daily with varying hours. Ulu Tempurong National Park is well worth a visit overnight or for longer stays. Due to the difficulty of getting here as an independent traveler one should make a reservation with a tour group. We used Adam of Travel Hub Brunei. There is no public transportation once you reach Bangar Town – a 45 min boat ride from Bandar Seri Begawan from which its another 25 minutes to the outside of the National Park. This park is really “off the beaten path” and very large; chances are you will be alone when hiking. The rainforest is one of Brunei’s primary attractions and the Trandie Marina Resort puts one just outside the Ulu Temburong National Park entrance (20 minutes via wooden boat up the fast moving brown colored river). Trandie amazingly provides free WiFi, as well as a zip line across the river and a small rock climbing wall. The rooms are clean but very simple. Alternatively the more luxurious Ulu Ulu Resort (www.uluuluresort.com) is located at the entrance to the park (again only accessible via boat). The rainforest “canopy walk” is one of the main highlights of a visit here. This canopy walk towers 42 meters above the forest floor at its high point; it is built entirely of aluminum. In order to reach the canopy walkway one has to climb up a rectangular structure which incorporates a series of almost vertical steps every 7 feet. Its best to be here in the morning as from the top one can see the floating mists above the jungle canopy, be serenaded by the cicadas and hear the occasional cry from a hornbill; you will look down over bright green rainforest in all directions. Consider cooling down at the small Hilir Waterfall after your sweat riddled climb up the canopy walk. This waterfall is located a few minutes by boat downstream from the trailhead to the canopy walk. After a short hike up the creek you reach the falls, a relaxing place to cool down and ponder the meaning of life as you are surrounded by the verdant greenery of the rainforest. A “Water Village” is located across from central Bandar Seri Begawan. The homes are on stilts (parking is underneath for each family’s personal boat, if they have one) and all the homes are connected by wooden walkways. This is a safe place to live, neighbors know each other and people go out and leave their homes unlocked all the time. I had the unique opportunity to actually visit the inside of several homes – the rooms are very ornately and colorfully decorated. Adam (owner of Travel Hub Brunei) is planning to open the only guesthouse of its kind in one of the homes here in the next few months. This will be a unique place to experience “local Brunei life” and will be an excellent affordable alternative to the main hostel in Bandar Seri Begawan. Pasar Gadong Night Market – much of what you will buy at this market is merely one Brunei dollar. As a result its fairly inexpensive to build a filling meal just by stopping at several of the vendors. Not only does this market have a wide variety of foods including some delicious BBQ but also fruits, vegetables and seafood. Tamu Kianggeh Market is located along a wide canal just in from the main pier in central Bandar Seri Begawan. This market is easily accessible by walking anywhere from central Bandar Seri Begawan. Vendors sell a variety of fruit and vegetables. Boatmen often cruise back and forth in the nearby canal trying to drum up business to go see the Proboscis monkey or take a water village tour. The Empire Hotel is Brunei’s only 5-star luxury option and what an option it is. When you walk into the grand entrance an appropriate word is “wow”. When you find out the price, again you may utter “wow”, not because the price is unexpectedly unattainable but because of how reasonably priced this resort is based on what it offers. It is Brunei’s only hotel resort to face the South China Sea. It is accessible via a drive of 20-30 minutes from Bandar Seri Begewan. This hotel is the vision of the Royal Family (originally built as their guesthouse) and has been opened less than 10 years. The inside is truly impressive, glittering with gold, boasting giant columns and a ceiling that has to be a good 35 meters above the first floor. Oh and for the price this is one heck of a value with rooms starting at 200 Brunei dollar / night! Coffee Bean & Tea Leaf was established in 1963 and their convenient location is in central Bandar Seri Begawan not far from the main mosque. This is well frequented meeting place by both tourists and locals alike. Choose from a variety of coffees including the Brunei latte as well as fruit drinks. WiFi is free. Seri Kandi Cafe (since 1974) is located at Ground Floor No. 18 & 19, Block B in the Q-Lap Complex, Kg. Kiulap. Phone: +673 2460432. This is another restaurant that only locals know about. Good roti and sauces. Tarindak Restaurant is located at Jalan Kota Batu near the waterfront just down from the central part of Bandar Seri Begawan. This is the “best game in town” for the buffet dinner which features mostly local Bruneian cuisine. They are also open for breakfast and lunch. The restaurant is located on the second floor and is part of a complex which promotes local Brunei clothing and crafts (store is also on site). One of the highlights of a dinner here is the Ambuyat, a Brunei staple made from the powder of the pith of the Sago Palm tree. Water is added giving this a consistency of starch. Use 2 chopsticks, dip in and twirl until you have a enough and then dip into any of a number of sauces. This food item is not one you chew, rather you swallow it in one gulp, basking in the spicy afterglow of the delicious sauce. Our favorite is the Durian chili sauce. Besides the main courses, local salads, soups and desserts are available. Brunei is a 2.5 hour flight south from Bangkok Thailand – several carriers operate flights to BWN (Brunei Airport) including Royal Brunei (non stop from a number of locations including select cities in Australia) and the budget carrier Air Asia which stops in Malaysia if you are coming from Thailand. Royal Brunei also offers non stop flights from New Zealand, Dubai, London as well as other major Asian rim cities. Brunei’s International airport (BWN) is very small and easy to navigate. We usually allow 2 hours before International flights but for a recent mid day International flight, 1 hour prior to the flight was more than enough time! There are a number of banks within Bandar Seri Begawan and we had no problem using our ATM. HSBC also has branches in select locations throughout Brunei. Do not be alarmed if you find Singapore notes in your wallet. Their currency is also accepted in Brunei although be sure to only accept non torn bills. Our trip would not have been possible without the help and kindness of a few select people. These are people you want to meet when you travel to Brunei. More touring in Brunei Greetings from Brunei Touring Brunei Brunei Blogger Meetups Jungle Greetings! Nice saying of article and pictures of Brunei Darussalam. I like this place. Thanks for explaining this valuable information about Brunei Darussalam. Gosh! I’m just next door in neighbouring Sarawak (Malaysia) on the island of Borneo and I’ve never been there. Blush! Blush! Thanks for the detailed info – must hop over one of these days. Yes, how much gold plate it takes to cover a surface area of that size must be great indeed! Hi Dave! Hal from Trandie Marina Resorts here, I’m glad you enjoyed your visit to Temburong back in 2011! P.S. I am loving the amazing photos you’ve taken all over the world, saves me having to travel! Haha 🙂 Keep up the amazing work!